Ingredients: Organic Nut Butter Blend (Organic Hazelnut Butter, Organic Cashew Butter, Organic Almond Butter), Organic Brown Rice Syrup, Organic Rolled Oats, Organic Oat Flour, Organic Pea Protein, Organic Date Paste, Organic Tapioca Syrup, Organic High Oleic Sunflower Oil, Organic Dried Cane Syrup, Organic Cane Syrup, Organic Rice Starch, Organic Brown Rice Protein, Organic Palm Oil, Organic Rice Flour, Organic Alkalized Cocoa, Vegetable Glycerin, Natural Flavors, Sea Salt, Organic Unsweetened Chocolate, Organic Coconut, Organic Cocoa, Sunflower Lecithin, Mixed Tocopherols (Antioxidant). Really sweet, but good for a treat here or there. Delicious and filling. Thumbs up! This bar is excellent! My favourite of all of the clif bars. Great having something nutritious and really satisfying the craving for a sweet treat. I really like Clif Nut Butter bars. This flavour is very good, not my favourite (chocolate/peanut butter is THE best! ), but a close second. 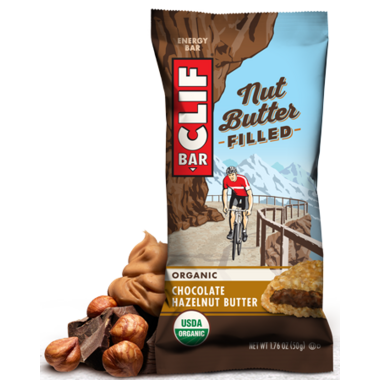 If you try the Clif Nut Butter Filled bars, you will become a fan!